A group of young men are working together to tackle suicide. 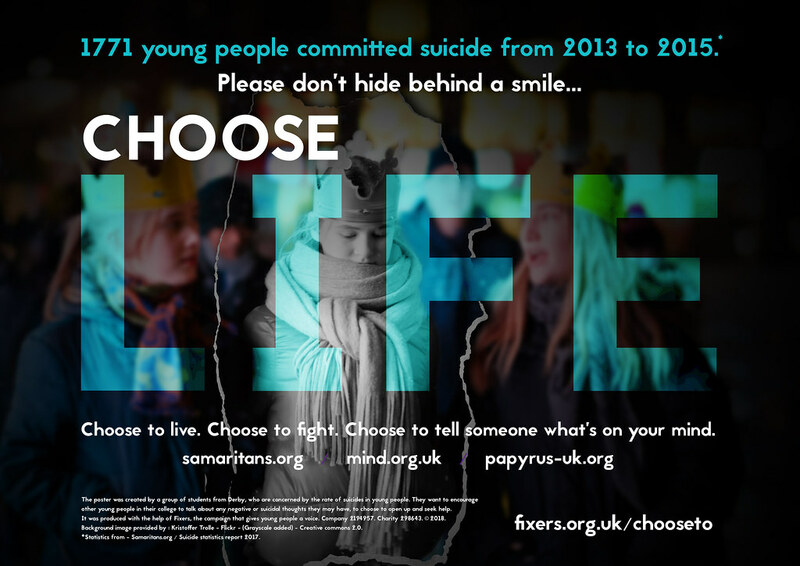 Fixer Joe Yates, 18, led the Derby College students in their campaign to produce an empowering ‘Choose Life’ poster. The poster comes at a time when nationally there has been an increase in the number of university students taking their own life, with an emphasis on male suicide. ‘We made a resource to share the hotlines people should call to try and get some of their problems off their chest,’ Joe explained. The group of students teamed up with Fixers to create a poster encouraging society not to ‘hide behind a smile’. Speaking to AOL earlier this month, the Samaritans chief executive Ruth Sutherland discussed the issue and called for it to become a national priority. ‘We believe there is an urgent need for more up-to-date and comprehensive data on deaths by suicide in the UK and we want to see this made a priority,’ she said.